Updated feature lets you toggle individual files! Updated to work with the new github split diffs as well, and now works without reload! Github's diff views are terrific, they let you code review easily, but sometimes there's too much to go over! This extension lets you filter out the noise. 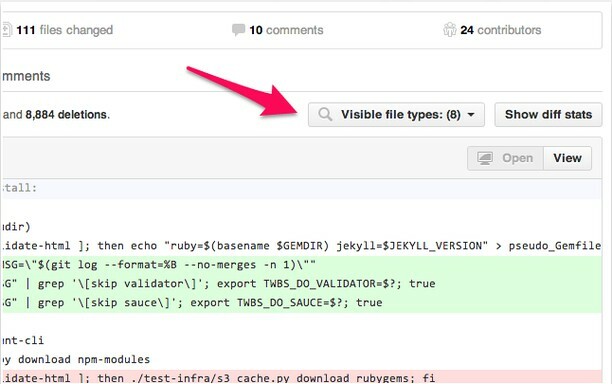 Adding a small button in the Github diff view, you can select which file types you want to hide. Especially useful when you compile your css with SCSS/LESS, and you don't want to go over tons of generated css files. Or when you write CofeeScript and don't want to go over the generated js files. The extension also helps multiple code reviewers, when you are only in charge of code reviewing a small portion of a large diff.